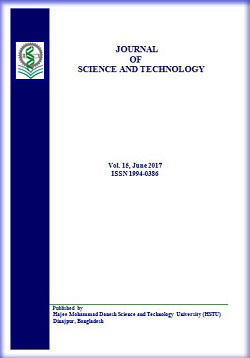 We are pleased to inform you that the Journal of Science and Technology (ISSN 1994-0386) is an official journal of Hajee Mohammad Danesh Science and Technology University, Dinajpur-5200, Bangladesh. This journal is running under an internationally respected editorial board. The Hon’ble Vice-Chancellor of HSTU is the chief editor. We are publishing regularly in printed form as well as in online version. Please visit the (hstu.ac.bd). Note is that we will soon publish the forth coming issue of this journal. The Journal of Science and Technology welcomes papers on all aspects of Life science, engineering and business administration. Authors from all concerns of science and technology are requested for submission of manuscript to this journal. We aim to provide rapid publication and speedy responses to authors, with all papers being reviewed by at least two independent referees. You are requested to circulate this information in your department and relevant colleagues. Journal of Science and Technology University © All Rights Reserved. Developed by Programmer's Team, IT Cell, HSTU, Dinajpur-5200.